A few weeks ago I bought way too many figs at the farmer’s market. There was no way to finish them all before they went bad. In an effort to curb food waste, I decided to make some fig infused vodka! 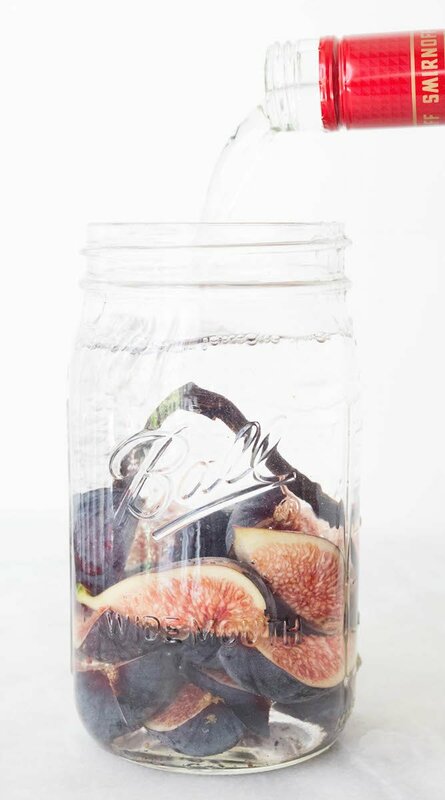 That’s right, I love figs so much that I even feel the need to incorporate them into my cocktails. 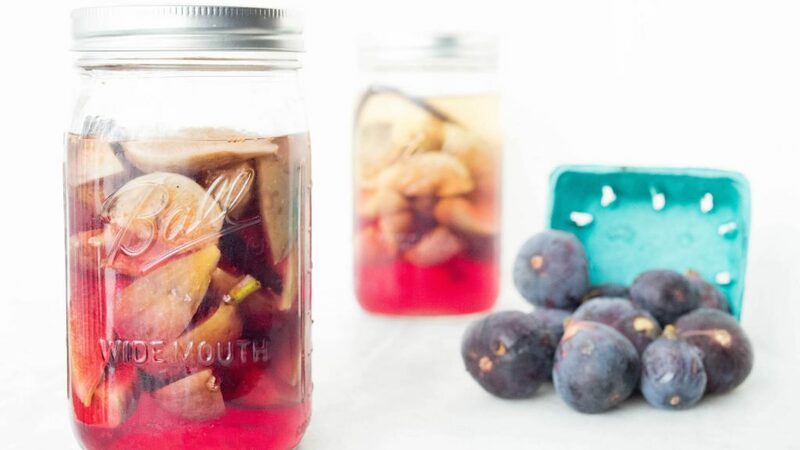 Making fruit infused vodkas is really easy and a great way to impress your friends. 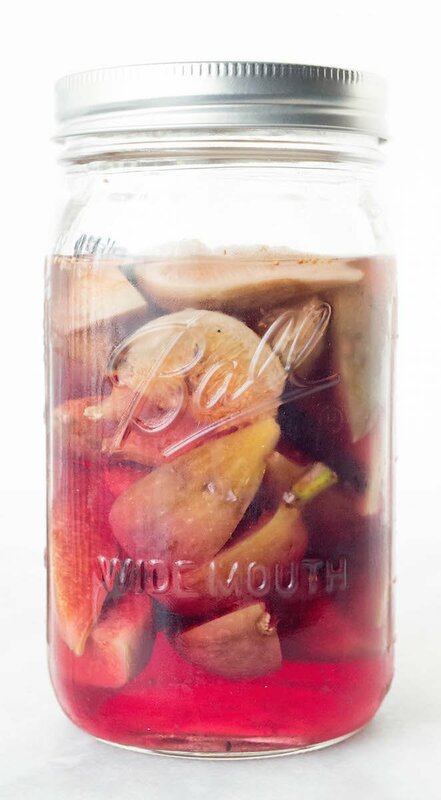 Holiday season is coming up and tying a ribbon on a jar of infused vodka makes an excellent, budget friendly, DIY Christmas gift. All you need to make my fig infused vodka is a bottle of Vodka, a fresh vanilla bean, 2 mason jars, and 2 pints of fresh figs. I used Black Mission figs because they are generally sweeter than Brown Turkey figs.
. You can put them all in one giant one if you’d like, but I was planning on giving one away and wanted two jars. 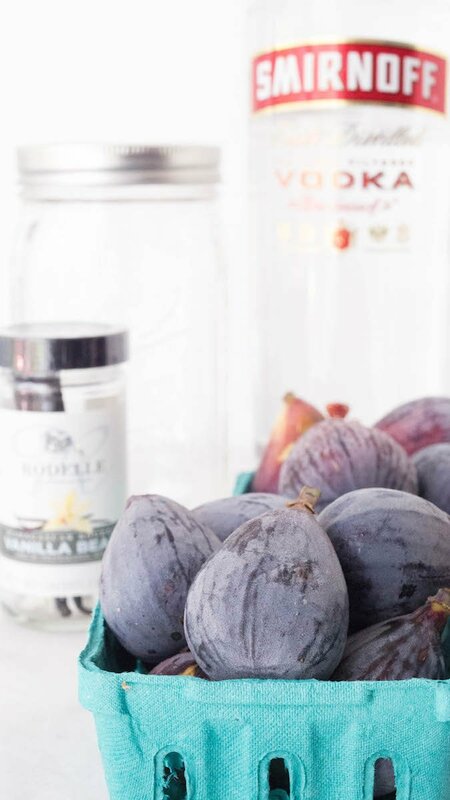 After securing the lid, store your fig vodka in the refrigerator for 2 weeks. After 2 weeks has passed, the vodka will have turned a bright pink color. Just strain and now you’re ready to make some delicious figgy cocktails! We often drink it on the rocks or mixed with Perrier. Wash the figs, then cut into halves or quarters. Place all the ingredients into two 32oz mason jars, or one 64oz mason jar and seal. Place in the refrigerator for 2 weeks. Return strained vodka to jar and seal. Serve immediately or store in the refrigerator. This is so clever. What a great way to deal with figapocolypse! I bet this would be phenomenal around the holidays. I once tried pomegranate-infused vodka and that was great. I bet this is just as delicious! I had way too many figs on my tree, so have a bunch in the freezer. Would they work in this recipe? I’ve never used frozen fig, but I don’t see why it wouldn’t work. Please let me know how it turns out! I bought a huge bag of organic dried Smyrna figs. It says they are tender and juicy. Would they work in this recipe? I have not tried this recipe with dry figs, but I don’t see why it wouldn’t work the same. Please let me know how it goes! I always dry figs for use throughout the winter. I soak them overnight to use in my muesli. As the water in which they soak is delicious, I decided to steep some in vodka. I already make both lemon vodka and honey vodka the same way. It is unbelievably delicious, though I steep them for a month. It is essential that you keep the Mason jars in a dark cupboard and bottle them in dark glass bottles.